44 percent see the NFL less favorably because of the players who kneel during the national anthem as a protest against racial injustice. 35 percent said the protests gave them a more favorable view of the league. 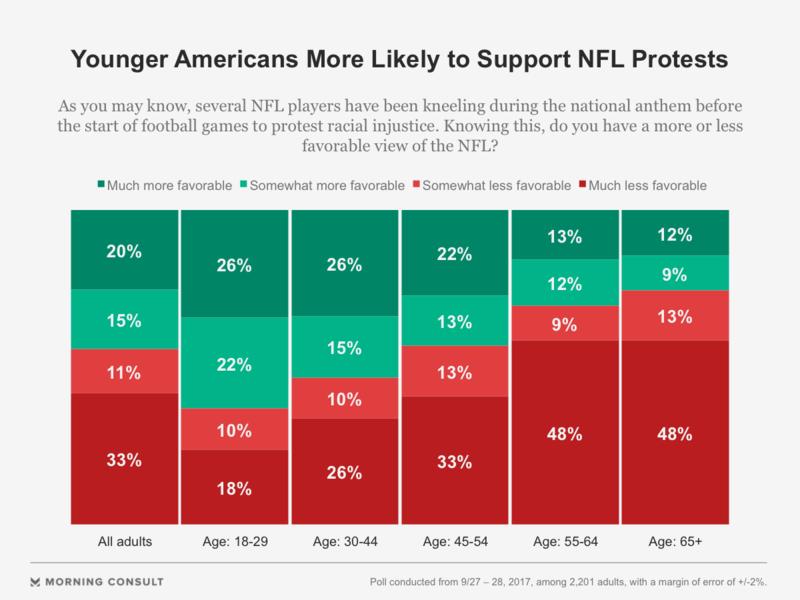 Views also reflected age and racial divides, with younger respondents and African-Americans more likely to support the kneeling players’ actions. As the debate continues to rage regarding National Football League player protests during the national anthem, a new Morning Consult survey shows a plurality of U.S. adults are taking a dimmer view of the league. The poll surveyed 2,201 U.S. adults from Sept. 27-28, several days after President Donald Trump began rebuking NFL players who decided not to stand during the national anthem as a protest against racial injustice. Forty-four percent said the demonstrations prompted them to view the NFL less favorably, with one-third of all respondents saying they had a much less favorable view. In contrast, 35 percent said the protests gave them a more favorable view of the league. 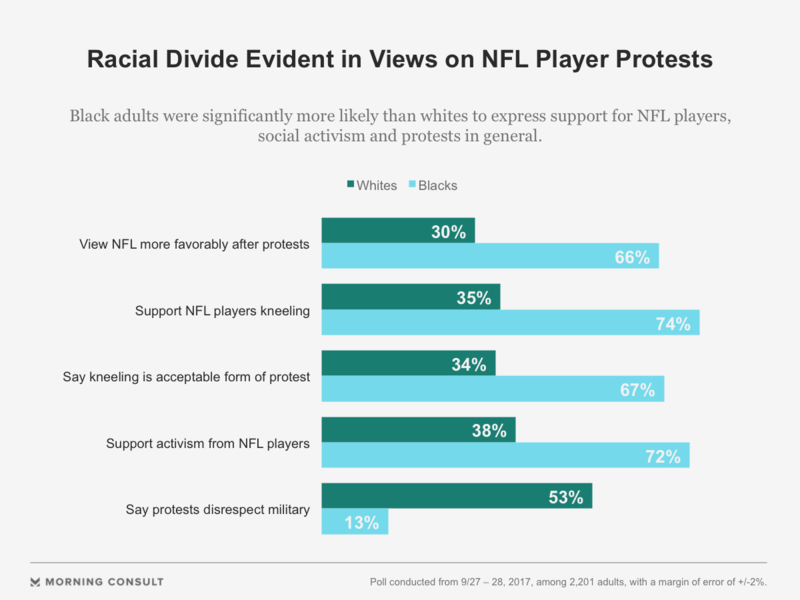 But views toward the NFL also reflected age and racial divides, with young and black U.S. adults more likely to support the players’ actions. For example, 48 percent of 18-to-29-year-olds, a plurality, viewed the league more favorably after the protests, the highest percentage among age groups. Those findings come as the share of U.S. adults who view the league favorably has plummeted by 18 net points in recent weeks, according to Morning Consult Brand Intelligence. On Sept. 21, 54 percent of adults surveyed said they viewed the NFL favorably, while 24 percent took an unfavorable view. By Tuesday, support for the league dropped to 47 percent — tied with average favorability for the professional sports industry — and 35 percent viewed it unfavorably. The controversy isn’t new. Former San Francisco 49ers’ quarterback Colin Kaepernick began kneeling for the anthem in the NFL preseason last year. But the president reignited the debate during a Sept. 22 rally, saying NFL owners should cut ties with players who decide not to stand for the anthem. Ratings continue to go down; more people are saying they’re watching less football because of the protests, so it’s real. For the first three weeks this season, Nielsen said the league’s viewership fell 11 percent compared to the same period in the prior year. Rick Gentile, director of the Seton Hall University Sports Poll, said other factors have also affected ratings, including the 2016 presidential election and the growing trend toward cord-cutting. But he said the increased focus on the protests this year was likely hitting viewership. “Ratings continue to go down; more people are saying they’re watching less football because of the protests, so it’s real,” Gentile said in a phone interview Monday. The president, meanwhile, continued to rail against the protests via Twitter, accusing players of disrespecting the American flag and members of the military. The survey shows a slim plurality of U.S. adults (46 percent versus 41 percent) tended to side with the president, saying the protests were disrespectful to military service members. But respondents were divided on NFL players’ wading into activism: 43 percent agreed that NFL players should use their platform as athletes to raise awareness, but a nearly equal number (42 percent) said NFL players should “stay in their lane” when it comes to political and social issues. Speaking about a league dominated by black players, Trump said “the issue of kneeling has nothing to do with race.” But the survey suggests a significant racial component to public opinion, with African-Americans far more likely than whites to side with NFL players who choose to not to stand during the anthem. Joe Feagin, a professor at Texas A&M University who focuses on race relations, said the divide in opinion is rooted in country’s history of racial oppression, with discriminatory policies that still target African-Americans and other minorities. “The bottom line is that blacks react to such surveys from their own and their families’ lived experience with discriminatory policing — the main reason for current black athlete protests — while most whites have not had that everyday experience,” he said Tuesday via email. Kohan noted Anheuser-Busch employs more than 1,100 military veterans and has supported the armed forces and the national anthem as well as diversity and freedom of speech. “We have many long-term sports partnerships, including our NFL sponsorship, and while we may not agree on everything, we still believe in the power of sport to bring people together and overcome their differences,” he said. While the NFL has seen its ratings slide this season, the players’ protests are likely only exacerbating a longer-term viewer trend of moving away from traditional cable or satellite television. Research firm eMarketer predicted last month that 22.2 million U.S. adults will have canceled their traditional TV subscriptions by the end of this year — an increase of 33 percent from the prior year. For now, NFL ratings still regularly exceed the ratings of its competitors in professional sports, and until advertisers start to pull out, there’s little reason for worry, said Gentile of the Seton Hall University Sports Poll. The NFL is still “DVR-proof,” he said. “It’s still getting men 18-49; it’s still doing all of the things advertisers want — it’s just not doing it with quite as much ferocity as it used to,” he said. Correction: A previous version of this story misstated the month when eMarketer released its forecasts.